Oshi Casino – What is this online casino all about? We show you how Oshi casino operates in a tough industry. See how this competitive built site fairs in catering to the masses with its unique banking methods, customer service, games and more. Oshi Casino may only have been founded in 2015 but has been gaining increasing popularity and an exciting rate. This is the first online casino launched by Softswiss and 90 Limited London Casinos so both parent and child will have a lot to prove in this area. Surviving the first year however is a good sign and we'll put together all the information we can find in the review below to see if they have what it takes to make it for the long haul. Oshi Casino strives to build a true international presence by reaching out to all corners of the globe. They've been licensed by Curacao eGaming and can therefore legally trade in nearly all countries with the exception of the United States and the United Kingdom. Their support in terms of languages spans across to English, Portuguese, Swedish and Russian and they also support a number of international currencies like Australian Dollars, US Dollars, Euros, Russian Rubies and even Bitcoin. Oshi Casino has made a good effort to bring not only entertainment but also convenience to their members by making their games quickly accessible through instant-play. Most of the games they host are also available on mobile platforms, allowing anyone on the go to take a few minutes and enjoy a game. Oshi Casino can further boast of their reliability after receiving the revered Certificate of Trust. In order to provide their members with unlimited entertainment options of the highest quality Oshi Casino had to team up with a number of great software developers to supply them with fantastic casino games. They did not disappoint and players will find some familiar games available in their casino rooms from respected companies such as Microgaming, NetEnt, BetSoft, SoftSwiss, Ezugi, Amatic Industries, Endorphina, Habanero and Mr. Slotty. NetEnt will be known to anyone who's spent some time in online casinos. They've been in the industry for over 20 years and have created some of the most popular and addictive slot games. NetEnt is well known for the impeccable quality and design they put into their slot games and have revolutionized some of the gaming mechanics we've come to know and love. They are also responsible for bringing us the rock 'n roll slot trilogy in the form of Jimi Hendrix Slots, Guns N' Roses Slots and Motorhead Slots. Microgaming is considered the main rival to NetEnt, making these two the main contenders for the title of the ultimate casino game provider. Microgaming was founded in 1994 and their success has gone nowhere but up. In 2002 they released their Viper Software which cemented their position as one of the top software companies in the world. Their Viper Software has since become the industry standard in terms of quality and usability for online casino backend software packages. Over the years Microgaming has also added quite the impressive list of games to their portfolio such as the highly popular Thunderstruck II, Immortal Romance, Karate Pig, Untamed Giant Panda and Retro Reels Diamond Glitz. Betsoft is well known for the incredible visuals used in their games. Their state-of-the-art 3D graphics coupled with the beautiful audio and addictive gameplay mechanics help make their games some of the most sought after in the industry and will have new players flooding in and old players coming back again and again. Today, they can boast a portfolio of over 150 games of the highest quality across countless themes. Their game offerings include slots, Blackjack, Roulette, Video Poker, table games, lottery games, Keno and 3D Poker. They are also proud to bring you a range of slot games that have been specifically modified to function on all model Windows, Android and iOS mobile devices. The list of mobile compatible games is expanding monthly and already include some of their most popular titles. They don't just offer great products but also put in the effort to look after their clients by providing industry leading support and service. The games list at Oshi games portfolio is rather impressive with not only a good number of gaming categories but also an excellent number of titles under each section totaling to nearly 700 games. They've also implemented an interesting layout for their games, first by providing an intricate and efficient sorting system to only view certain games but then too by discarding the traditional tile layout to display the games. Instead each game occupies a section that spans across the width of the screen. In this section is a preview image as well as the game's title. Players will also find a brief description of the game followed by a detailed description of the games information including the manufacturer, size, volatility, number of winning lines, number of reels and more. Additionally, moving the mouse pointer over the preview image will show a short clip of the game being played which is a nice touch. While this detailed approach is useful, we suspect it will make it more difficult to find certain games since only a few can be listed on the screen at any time. Next we head over to the live casino room where 9 tables are waiting to serve your every need. Among those tables are several varieties of Blackjack and Roulette. Video Poker is next on the list with another 16 titles such as Deuces Wild, Jacks or Better, Wild Texas, Multiwin, Split Way Royal, Deuces and Jokers and more. Finally we also have 6 games that are simply listed as "Casual Games" among which you'll find Pocket Dice, Minesweeper, Heads and Tails, Scratch Dice, Virtual Racebook 3D and Scratcherz. With every game category selected there's an infinite number of sorting options to be included such as sorting by manufacturer, theme, character group, visual style, file size, jackpots and various bonuses. Customer service is one of the most important aspects for any business to remain a popular choice among consumers. It is especially important for a new company to offer great services or their reputation could be tarnished forever and destroy any hopes they may have of a bright future. When inspecting the customer service of an online casino we first have a look at the FAQ section to see how much information has been made available to assist players on the fly. Oshi Casino has done a good job here by implementing a comprehensive FAQ section, or knowledgebase as they call it. This section contains several categories such as Golden Articles, Oshi Content Pages, About Oshi, Oshi Bonuses, Payments, Using Oshi, Games and Affiliates and each of these has a list of queries below them with their respective answers. If this is not sufficient in answering player queries then they may also contact the customer support team via live chat or an email contact form. Support is available 24/7 in both English and Russian although the exclusion of phone support is notable. The live chat option is available in the bottom right of most of the pages on the site, however to access the support page that includes the knowledgebase and email form one does need to navigate to the home page first and search for these options at the bottom of the screen. Once you know where it is, you'll be find but it's never good having to search for the support option when you're in trouble. Every online casino tries to lure as many new players as possible. Once a player signs up they will obviously do what they can to keep that member interested and coming back on a regular basis. To this effect, there are few things as effective as special promotions as it provides players with something extra simply for being a member and makes them feel appreciated. Here are some of the special offers currently available at Oshi Casino. 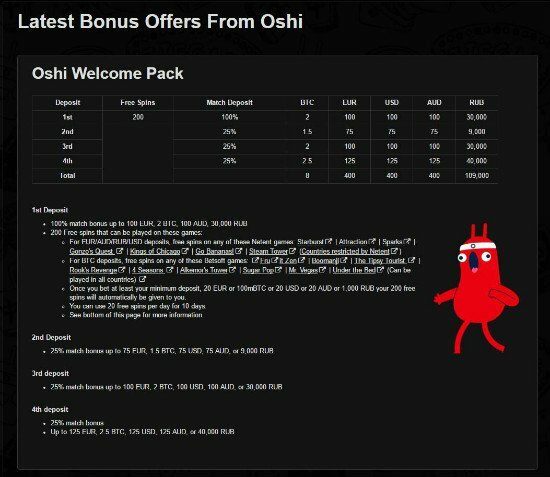 Oshi Casino welcome bonus is great to attract new players into joining their lists. This bonus offer is spread across 4 deposits and may provide players up to a total of €400 as well as 200 free spins. When a player signs up for a new account and makes that first deposit, they will receive a 100% deposit bonus up to €100. In addition to that, 200 free spins will be awarded over a span of 10 days, providing 20 spins each day. These spins can't be played on all slot games though but instead of allowing them to be played at only one game, players do at least have a choice of several including Starburst, Attraction, Gonzo's Quest, Kings of Chicago, Go Bananas!, Steam Tower, Fruit Zen, Boomanji, The Tipsy Tourist, Rook's Revenge, 4 Seasons, Alkermor's Tower, Sugar Pop, Mr. Vegas and Under the Bed. When making further deposits players will only receive a 25% bonus although the amount differs for each deposit as can be seen below. To qualify for this bonus a minimum requirement of €20 is needed and players will also need to meet a wagering requirement before any funds may be withdrawn. At Oshi Casino the wagering requirement is 40x the bonus amount which is on par with the industry standard. Players also need to keep in mind that bonuses are only valid for 30 days after which they expire. Every day presents a new opportunity at Oshi Casino. Each day players may sign into their accounts and find a new reload bonus on offer that offer a deposit bonus as well as free spins. The details of this bonus will be provided daily along with the bonus code required. As if a random reload bonus for every day wasn't enough, Oshi Casino also offer a range of other reload bonuses for specific days as can be seen below. Oshi Casino offers an exclusive VIP experience to select members that have caught the attention of the management at Oshi. This VIP program is not available to the public and instead members will receive an invitation to join once they meet the requirements. There is also nearly no information available on what the benefits of this program will be apart from it including personal account managers, exclusive games and random gifts. This is because they provide a customized VIP experience for every player depending on their preferences. Oshi Casino payments has made a good number of payment methods available to add maximum convenience for their customers. While this list may not be as extensive as others it does include all the most popular options and also includes Bitcoin which most online casinos do not. Here is the list of the payment methods on offer. The withdrawal processing times are rather impressive although they only allow withdrawals to be done via eWallets. When requesting a withdrawal the transaction will remain pending until it's been assessed which takes up to 24 hours. Once the transaction has been approved it should be available in the player's account within an hour. Oshi Casino hasn't put together a distinct theme for their website to stand out but rather opted for a plain black background for all pages. The home page does sport a large scrolling banner though which contains some useful information on bonuses. This banner also includes some great graphics from various games but other than that the site is pretty much devoice of any serious design. The top of the page plays host to the navigation bar with links to Games, Providers, Bonuses, VIP, login and registration. As mentioned previously, opening the games menu presents players with a whole list of sorting options and a lot of information on the games themselves. While this layout is definitely useful, it's not the most user friendly setup we've come across. While there's nothing inherently wrong with the website, it definitely doesn't stand out at all, in fact it comes across as being a little too calculated, if that makes any sense. Oshi Casino has done some great work in the past year to get their services off the ground. They have a fantastic games selection from some very good providers and they offer some decent bonuses to new and existing players. It's also nice to see a new casino offering 24 hour support and other player benefits include lightning fast withdrawal times and a personalized VIP program. The negative marks here are few but they are there. First there is the lack of phone support which is not that big a deal nowadays anymore, especially when live chat is offered although there are still some players who prefer to speak to a representative on the phone. Then there's the strange website layout which doesn't always feel like it makes sense and could leave some players a bit lost. Overall, Oshi Casino does seem to have things underway and we suspect they'll continue to do well in the near future. - Website is not user friendly.